Please do not let the title of this post intimidate you. This would be a typical title for a paper in a scientific journal, but I promise to keep the language understandable, lively, and captivating. I also hope that you will be more likely to visit scholarly publications to learn more about the insect or arachnid subjects that interest you. I had the good fortune of stumbling upon a small sawmill in Black Forest, northeast of Colorado Springs, in June of 2016. 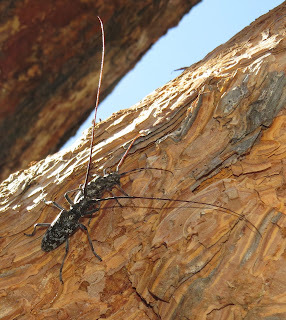 The property owners, perhaps begrudgingly, gave me permission to look for insects in the stacks of Ponderosa Pine logs there, and it proved to be a "Beetle Bonanza." I visited on several occasions and found scores of jewel beetles (Buprestidae), longhorned beetle (Cerambycidae), checkered beetles (Cleridae), and a few bark beetles (Curculionidae: Scolytinae). Among the more abundant species among the logs was the White-spotted Sawyer, Monochamus scutellatus. 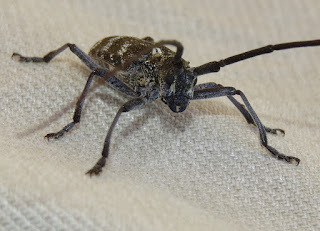 These are fairly large insects, 15-27 millimeters in body length, and members of the longhorned woodborer beetle family. The long "horns" refer to the antennae of these beetles. 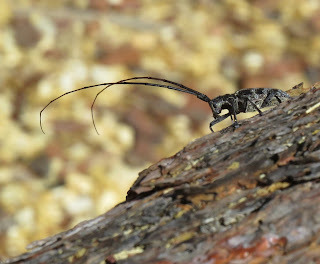 Males have antennae that may be twice the length of their bodies or even longer. The front pair of legs is also longer than in the females, and the front tarsi ("feet") are expanded to better grip the female during mating. What I observed in one pair of sawyers prompted me to read about the mating behavior of the species, if only to confirm my hypothesis that the male guards the female he has mated with to prevent rival males from usurping his genetic investment in her offspring. It turns out there is even more to the story than I imagined, and I hope to observe those other behaviors at some point, too. White-spotted Sawyers breed in dead, dying, injured, fire-scorched, or recently-felled pines, true firs, and Douglas fir, and spruce. 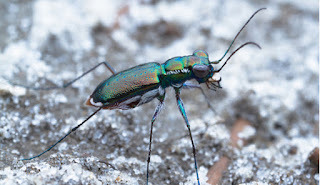 Such resources are rather scarce in a forested landscape, so it pays males to stake them out with the understanding that eventually females will visit in order to lay their eggs (oviposit). Surprisingly, the males emit a pheromone that draws additional males to an oviposition site. The airborne chemical cue is called an "aggregation pheromone." Despite their size and ungainly antennae and legs, sawyers are accomplished fliers and easily make their way to the source of the pheromone. 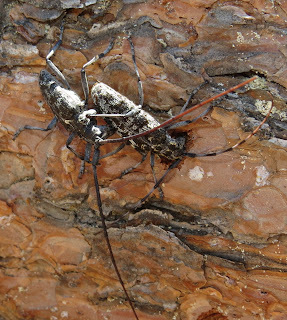 Once there, the largest males with the longest antennae may square off in one-on-one duels for possession of the oviposition resource, which is the area of the tree trunk with greatest circumference. 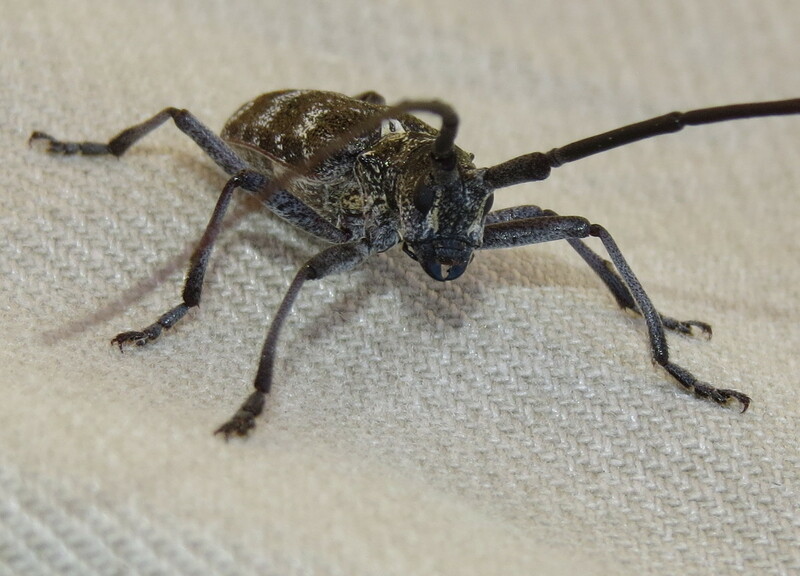 They lash at each other with their oversized antennae, and may grapple by locking their jaws and biting. Smaller males generally back off, giving way to larger rivals based on antenna-length alone. The dominant male mates with incoming females that may then disperse to lay their eggs. This is not what I observed, but the reference I am reading goes on to describe what I did record. 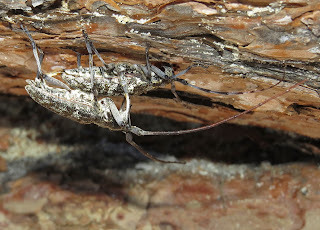 I witnessed copulation between a male and female M. scutellatus, during which time the female was "multi-tasking," chewing a small cavity in the bark. At the conclusion of mating, the female turned around to deposit at least one egg in that cavity while the male continued to grasp her in a loose but protective embrace. She then turned again and appeared to resume chewing the bark cavity, but perhaps she was grinding sawdust to cover her egg. Fret not about the smaller male beetles, they may achieve mating success by protecting a less optimal tree bole; and they may profit from the expensive production of aggregation pheromone by other males. Smaller males are usually more agile and vigorous than their larger conspecifics. The entire life cycle of the White-spotted Sawyer takes from one to two years as the larva that hatches from the egg bores first under the bark, then tunnels deep into the wood, sometimes reaching the heartwood. It eventually pupates in a cell near the surface, metamorphosing from a larva into an adult beetle. Once it leaves the pupa, it remains in the pupal cavity while its new exoskeleton hardens. It then chews its way to freedom, a journey that is clearly audible to the human ear. Female resumes gnawing, covering her egg? 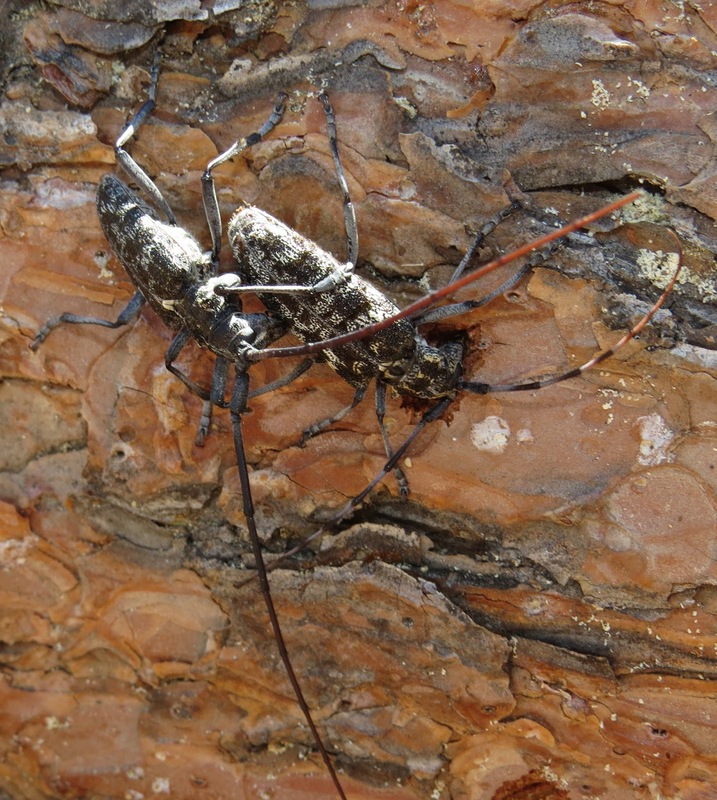 It is important to note that this species, like the overwhelming majority of other longhorned beetles, is not a forest pest. 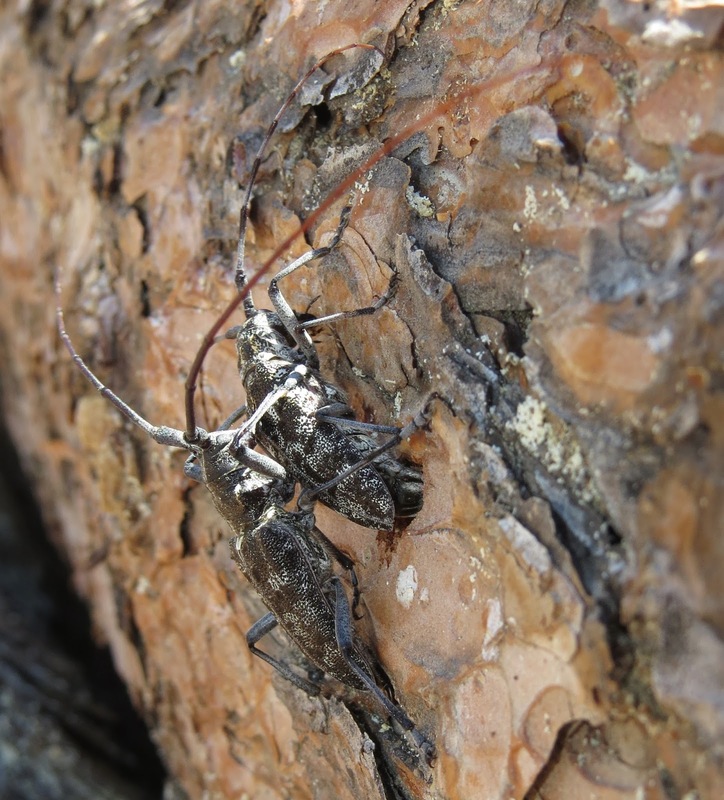 Yes, it can negatively impact logs in situations like the sawmill, before they are cut, but they do not kill living trees outright like the invasive Asian Longhorned Beetle, Anoplophora glabripennis. Sawyers are an important and charismatic part of the invertebrate fauna in coniferous forests across Canada and the northern U.S., and major mountain ranges farther south. Wang, Qiao (editor). 2017. 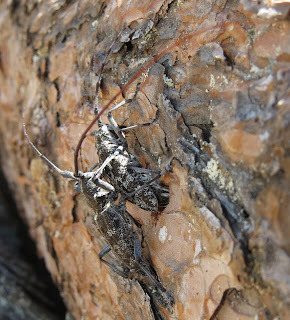 Cerambycidae of the World: Biology and Pest Management. Boca Raton, Florida: CRC Press. 628 pp. 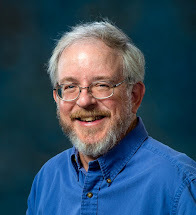 One of my unfortunate duties as a blogger of truth and science, here and at Sense of Misplaced, is that I must occasionally dispense bad news. There are plenty of awful stories these days, but bear with me and I'll conclude with something uplifting. 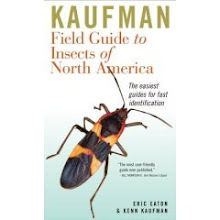 The insect story getting the most press right now, by far, is the "Insect Armageddon" opinion piece in the New York Times, and the follow-up article about the German citizen scientists who made the observations. It appears that there has been a precipitous decline in insect abundance in many parts of Europe, up to 75% over the last twenty-five years. Should the numbers hold up to repetition, this is indeed alarming, if not catastrophic. 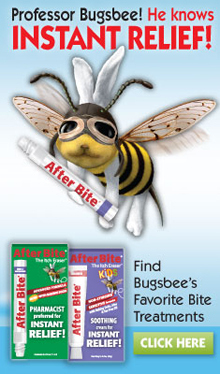 Insects are the foundation of all major biological processes. You can do the math, use your imagination, and draw the obvious conclusions. There are plenty of places to point blame for the demise of insect populations, and wildlife declines in general, but accusations and rhetoric are not likely to reverse the course of events. We have to act personally, and locally, to go about changing things for the positive. That means resisting the urge to grab the over-the-counter insecticides, planting native trees, shrubs, and flowers in our urban and suburban landscapes, growing our own vegetables without using chemical treatments, putting up "bee condos" for solitary bees....There is no end to what we can do, and it does make a difference. You are setting an example, for one thing. Meanwhile, our very own government agencies are against us here in the U.S. Make no mistake about it, the current edition of the federal administration is out to ruin public lands in many ways. I already wrote about U.S. 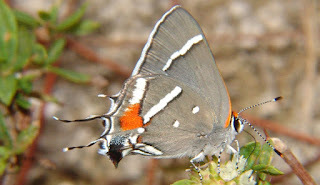 Fish & Wildlife granting permission for the construction of a strip mall known as "Coral Reef Commons" on globally endangered pine rockland habitat near Miami, Florida. The President's directive to shrink Bears Ears National Monument and Grand Staircase-Escalante National Monument is further proof of the overriding policy to open public lands to private interests, namely those in the natural resource extraction industries. 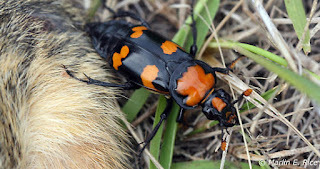 It is also quite probable that a lawsuit filed by The Independent Petroleum Association of America, American Stewards of Liberty, and Osage Producers Association will result in the de-listing of the endangered American Burying Beetle, Nicrophorus americanus. This is in spite of the fact that there is grave concern as to whether the species is truly "recovered." 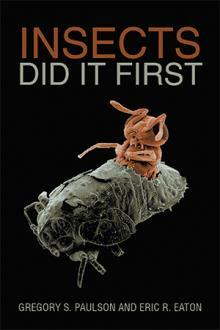 It is found only in a handful of isolated locations whereas its historical range was over most of the eastern U.S. It also remains largely a mystery as to why it disappeared in the first place. Until a better understanding is reached, any action toward removing the species from the endangered list is premature at best, and irresponsible at the least. God forbid any creature, Native American population, or other sacred entity stand in the way of short-term profits for greedy corporations. Ok, I promised some good news, and here it is. 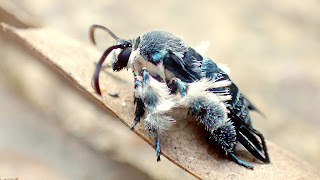 It was recently revealed that a spectacular species of clearwing moth was rediscovered after a gap of 130 years in the scientific record. Known previously from only a single specimen housed in a museum in Vienna, Austria, Heterosphecia tawonoides was observed in the Taman Nagara rainforest of Malaysia. It just goes to show how little we know about a planet we are hell bent on destroying in the name of "progress." Resolve for the new year to get involved, get outdoors, document, record, and report what you find. You never know where your personal discoveries will lead; or whether you are the only thing standing between a lone population of some creature and its potential extirpation. I'm facing that right now myself, but more on that later. It has not been my intent to deprive you of new content on this blog, but personal realities have dictated that I put my energies elsewhere, or have actively blocked my creative mindset. My internal motivations have been dealt devastating blows by external events that leave me wondering if I am making a difference. Meanwhile, I still deal with financial struggles and my aging father's circumstances. The last (or at least latest) straw is what happened this week with U.S. Fish & Wildlife approving construction of a Walmart and strip mall on one of the last large parcels of imperiled pine rocklands habitat near Miami, Florida. Bulldozers began their devastation on Thursday, but thanks to a lawsuit by the Center for Biological Diversity, and a court order issued by heroic U.S. District Judge Ursula Mancusi Ungaro, the engines of destruction have been shut off, at least for the time being. This dire situation, to be fair, is the end result of poor management by a number of property players. According to Save The Pine Rocklands, the Richmond pine rockland tract was formerly owned by the University of Miami, which acquired the area for free as military surplus land, in 1981 and 1997. The university then sold eighty-eight acres, for $22 million, to Ram Realty Services in 2014. It is Ram that is behind the "Coral Reef Commons" project that would include a Walmart, LA Fitness, Chick-fil-A, and Chili's; plus a 900-unit apartment complex. A mere 40 acres would be spared as a "preserve." Since this habitat depends on regular fire events for its existence, one has to wonder how apartment residents and business patrons would tolerate prescribed burns for ecosystem maintenance. That is not to mention whether the forty acres falls below some minimal territorial threshold for which a species could no longer survive. It also bears consideration whether pressure for continued economic development would not eventually compromise the rest of the property. You did it once, so you have set a precedent. The pine rocklands are home to a diverse and unique assemblage of organisms, including critically endangered species. Among those are the Miami Tiger Beetle, Cicindelidia floridana, found nowhere else on Earth. 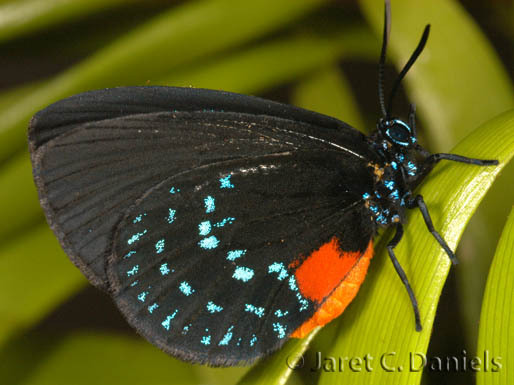 The Atala (Eumaeus atala) and Bartram's Scrub-hairstreak (Strymon acis), both butterflies, also exist in no other ecosystem. Florida Bonneted Bat is also at risk. Thirty-one plant species occur there exclusively; and a total of nine federally endangered species call the pine rocklands home. This is just the latest crime against our natural heritage as the President and his appointees go about dismantling all environmental, consumer, and labor protections for the benefit of an extreme minority of extremely wealthy individuals and corporations. This not politics, it is policy. Very, very bad policy that will negatively impact you, personally, at some point. The recent actions by the U.S. Department of the Interior, where the National Park Service and U.S. Fish & Wildlife agencies reside, have been decried as "dereliction of duty," but that is being too polite. This is outright theft of public lands and should be prosecuted as such. It is not failure to fulfill institutional mandates, it is criminal behavior. I pride myself on presenting you with an unbiased, apolitical blog here, but I have my limits of tolerance. Those limits have been vastly exceeded over the last few months, and I do not foresee improvement any time soon. I hope you will respect my personal desire to protect your right to your "pursuit of happiness" as it involves observing and enjoying the natural world in intact ecosystems. I also urge you to stay silent no longer. Thank you.